the city for most of his life. His music is now little performed, so it is a true ear-opener to be presented with his Passio del Venerdi Santo, composed about 1685, which sets the version of the story as recounted in the Gospel of St John. In purely structural terms the parallels with Scarlatti’s Passione secondo Giovanni of about the same date are close, but after that the similarities end. 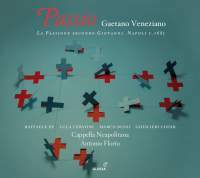 The most striking stylistic feature of Veneziano’s work is its remarkable modernity, which combines old and new in a manner that was to prove highly influential for Neapolitan composers of the next generation. For this ambitious recording the indefatigable Antonio Florio has worked up a sensitive realisation, which surely deserves to be published, from the single surviving source. Here the players of his Cappella Neapolitana (in essence a rechristening of the legendary group I Turchini which Florio founded years ago) give it a convincing and extrovert reading, with plenty of adroit and appropriate colourful touches and attention to detail; in many ways these instrumental performers are the heroes of the hour. The interventions of the unusually densely packed chorus are few and far between; the weight of the almost conversational narrative mostly falls on the three principal characters. Marco Bussi provides a firm and authoritative Pilate, while Luca Cervoni turns in a carefully nuanced Christ, rising splendidly to the occasion with a powerful account of Christ’s final agony. Accolades should also be handed out to Raffaele Pe, whose engaged and highly rhetorical approach to the role of the Evangelist is extremely effective. The final verdict must be that this is a moving and persuasive performance of a genuine masterpiece brought back to life.